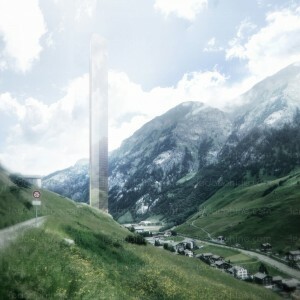 A dream or nightmare project that shakes the Swiss mountains. On Wednesday , March 25, in Zurich, Remo Stoffel a promoter of Graubünden (Eastern Switzerland) presented its program for its crazy Vals station where it already owns a spa. “The sky is the limit” is the slogan of the program centered on a 381m high hotel that would be the world’s highest and the highest building in Europe even eying the Eiffel Tower. A glass skyscraper with 107 suites, which some of them will occupy an entire floor. It is entitled “Woman of Vals” in honor of Alberto Giacometti. Not sure the famous Swiss sculptor would have appreciated. All this in a Heidi like postcard environment. The project is signed by the American iconoclastic architect Thom Mayne, as described by the New York Times. But it will have to be approved first by the municipal and cantonal authorities. Remo Stoffel hope that its achievement by 2019 will save the mountain tourism in the region which undergoes a severe crisis. He even predicts its death if no alternative is developed to mass tourism. He targets these customers who travels by helicopter and are ready to pay 1,000 to € 25,000 a night. “The premium segment is the only one that has a future,” insists the businessman who is to present his plan to the 1000 inhabitants of his village.